Living in Boston apartments with dogs is a popular trend that seems to be on the uprise. Yet, as all dog owners will tell you, renting an apartment with a dog can prove to be quite challenging. A fairly strict schedule is important in any dog’s home, but in an apartment, it becomes even more critical. Boston Apartments usually leave you with minimal or no yard space. Dogs are energetic beings, but some breeds need exercise even more than others. Apartments for rent in Boston do not usually come with a predetermined pet area; although, some actually do have pet exercise yards and dog walks. If you find one of those gems, hold on to that pad for as long as you can renew your lease. 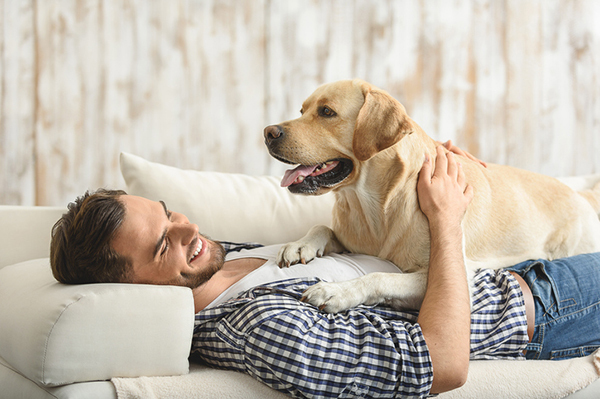 If you cannot find a great, dog-oriented apartment building, then you will need to establish your own routine to ensure your pal gets enough exercise to stay healthy and live a long life. Let’s back up to the main reason that an exercise routine for your pup is important. It is actually for your health first and foremost. Sure, your dog needs a routine, but so do you. You need to have a healthy exercise schedule that includes cardio, and walking is one of the most underrated cardio activities you can undertake. Not to mention that a set routine is psychologically one of the best ways to ensure you are mentally healthy and succeed at your career goals. Just google it. There are tons of articles out there on why having a daily routine is important, successful people and their routines, why meaningful morning routines are key to success, and more. Routine is the key to many health benefits, but the hardest part is getting it going. So start by making yourself accountable to your dog. It will help to motivate you to begin a new routine at all. You will not be able to look into those sad, playful eyes without thinking of that walk you promised every day when you first moved in. When you get a routine down with your pup, walks will be one of the highlights of your day because it is the absolute best moment of theirs! Your dog’s joy should fill you with happiness yourself. Obviously walking your dog on a regular schedule is beneficial, but in case you need more convincing we’ve compiled a few more reasons why. Leadership Training: In an apartment, there is a higher level of noise, activity, and distraction. By walking your dog, taking the lead, and showing him or her that you in charge and have things under control, you train them to trust you more in all circumstances. This cuts down on reactivity and increases their attention on you in distracting situations, like when someone else is walking by in a tight hallway with another dog. Healthy Benefits: PetMD sums this up perfectly, but basically your dog will be so much healthier if you walk them regularly. It cuts down on obesity, heart disease, hypertension, etc. It’s great for your dog’s digestive system to walk them regularly as well. Do More Destruction: Apartment dwellers with dogs always fear coming home to the dreaded trash tornado or anything torn up at all. Walking your dog and keeping their mind and body entertained on a set schedule allows them to calm down at home more. It not only exerts their energy, but they know that they have something to look forward to later and may not feel as inclined to tear up your couch or chew on your favorite shoes. Grow Your Bond: Walking your dog increases the feelings of kinship for both you and your pup. Your dog loves it when you walk him or her, and it takes a certain amount of trust. With each walk, you get the opportunity to build this trust and that special bond between dog and human. Think sheepdog or something that runs and runs like there is no tomorrow. If that sounds like your dog, sorry but 3 walks per day is probably the right number. At least you will be in shape! It’s hard to get home at lunch for a quick walk, but keep this in mind when choosing an apartment. Find a place close enough to your workplace to exercise with your dog around midday! Try this routine: breakfast, walk (2 miles) / lunch, walk (1 mile) / dinner, walk (2-3 miles). Some hounds and terriers fall under the medium activity dog category. They don’t need to be run or walked miles and miles a day, but they will not be healthy if they sit still either. For these dogs, just two walks per day when living in an apartment should suffice. Each of these should be up to 2 miles depending on how your dog seems to be feeling. Try this routine: breakfast, walk (2 miles) / dinner, walk (2 miles). Got a bulldog, a pug, or something that struggles to walk long distances or exercise too much? These little guys still need regular exercise to stay healthier longer. They just need to be walked a lot less. Lucky you! Now you can fit in some gym time too. Try this routine: breakfast, walk (1-2 miles) OR dinner, walk (1-2 miles). Each of these schedules is just a suggested starting point. Adjust it as you feel necessary. Take a look at how your dog appears before and after walks. Are they still too energized? Do they seem far too worn out? Only you know your pet best, and not every dog is the same. As with all pet health advice, talk to your dog’s vet about their exercise schedule and how much you should be walking them and feeding them every day. Incorporating their diet into your exercise routine is just as important for dogs as it is for humans. A fat dog is not a healthy dog. Help your dog enjoy a full and long lasting life with you by incorporating a diet and exercise routine! Get the real estate tips and news from our blog!